Present: Steve Klicker, Casey Ritz, Glen Bruhschwein, Ryan Jilek, Derrick Fox, Joel Emter, Joe Natwick and Jon Stika. Joel, Rocky, Casey, Jon, Ryan, Ellery, Derrick, Glen, Nate and Joe have committed to brewing 60 gallons of Double IPA to age in the club barrel. Most of the beer has been brewed and it is anticipated that the beer will be transferred into the barrel in early January 2016. 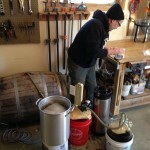 Jon will brew a make-up batch of DIPA sponsored by the club to be used to top-up the barrel as the DIPA ages. Ryan moved that the club purchase two used 5-gallon ball lock kegs including taps and portable cartridge-fed CO2 injectors. Seconded by Glen. The kegs would be used to contain club-sponsored beers to be served at future beer events. Motion passed. The club’s 5-gallon share of the Imperial Stout recently removed from the club barrel will be stored in one of the kegs as soon as the kegs are available. Club sponsored beer kits were discussed and it was agreed that 3 or 4 should be purchased in the near future. One or more of the kits would be brewed by a member, stored in a club keg and served at future beer events. Other kits would be brewed and shared with club members as in the past. Members were reminded that $25 annual dues will be payable at the January 2016 meeting. Any member paying dues at the January 2016 meeting would also be eligible for a one-year subscription to Brew Your Own magazine for a price of $10 if at least 10 members participate to get the group subscription rate. 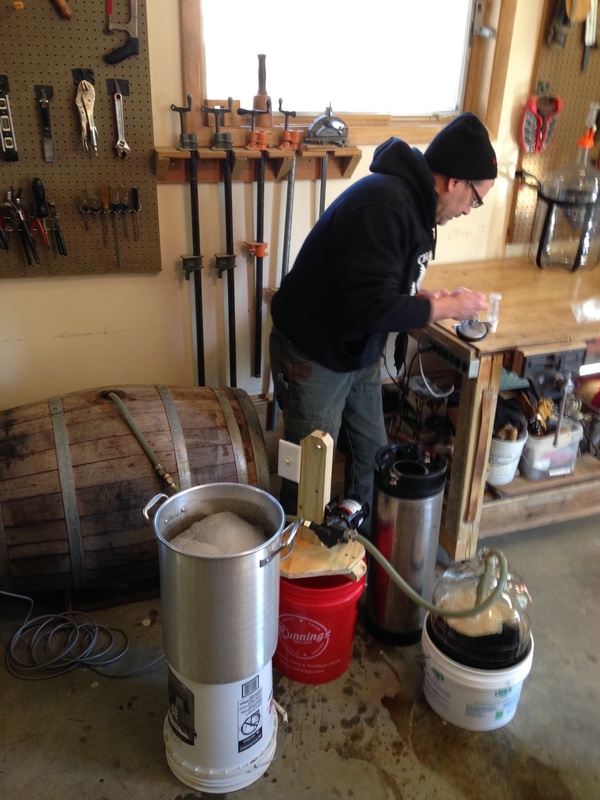 Rocky Stoltz in Jon Stika’s (not pictured) workshop pumping beer out of the club barrel into members buckets, carboys and kegs. Over 60 gallons of member-contributed Imperial Stout was aged in the used wine barrel from August 5th, 2015 to November 28th, 2015. You are currently browsing the Heart River Homebrewers weblog archives for December, 2015.